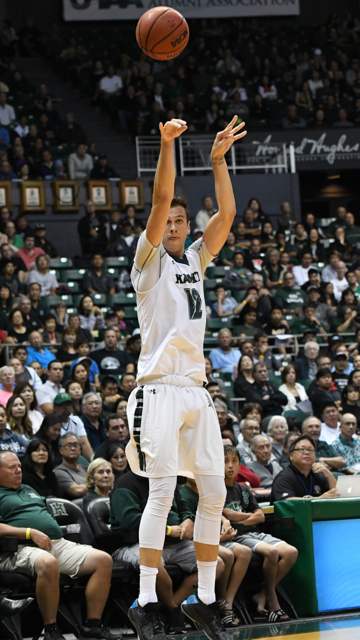 Jack Purchase scored 21 points and grabbed seven rebounds and Sheriff Drammeh added 14 points tonight to help Hawai’i hold off visiting UC Davis, 77-72, and move into sole possession of first place in Big West Conference men’s basketball. A vocal Stan Sheriff Center crowd of 6,581 watched Gibson Johnson and Leland Green each add 11 points as the Warriors improved to 13-5 overall and 4-1 in the Big West. fell to 12-7, 3-2. Cal State Fullerton, which had entered the evening in first place at 4-1, fell at Long Beach State, 81-73. UH broke a 39-39 tie early in the second half with a 10-0 run capped by Mike Thomas’ layup with 14 minutes to play, but UC Davis chipped away and eventually drew to 63-60 on Chima Monk’s finger roll with 1:44 remaining. But Green answered with a 3-pointer from the left wing 23 seconds later, and Johnson added a three-point play to make it 75-67 with 28.8 ticks left. The Aggies later closed it to 75-72 after AJ John’s deep 3-pointer from the top of the key and Siler Schneider’s layup off a baseline drive with 14.7 seconds remaining. But Purchase sank two free throws two second later to effectively seal the victory. The Warriors will conclude their four-game home stand on January 27, when they host Cal State Fullerton.